I sampled this beer back in May at the Holy Saviour Parish Craft Beer Event. I remember being impressed with how the high IBU’s were artfully masked. My friend Joe was also impressed with this beer and bought a case of it. He then in turn gave me this one to review. Thanks Joe, I can’t wait to finally delve into it. The beer pours a clear amber with copper/orange hues and a fairly rich off white head. The nose is nice with caramel malt aromas and the most pleasant hop complexity. Wow, that’s an IPA that I can love. What a great first sip. The experience starts out with a caramel malt sweetness up front on the tip of the tongue. That is immediately followed by a tingling effervescence over the tongue in the middle of the sip. There is also a slight hop robustness growing toward the back-end. The back-end is very easy drinking for an IPA with an almost effortless swallow. The hop robustness continues to build during the swallow into the finish. The finish is great; excellently balanced with rich caramel malt flavors and a wonderful complex hop bite. The hops in this beer are never overpowering or bitter. 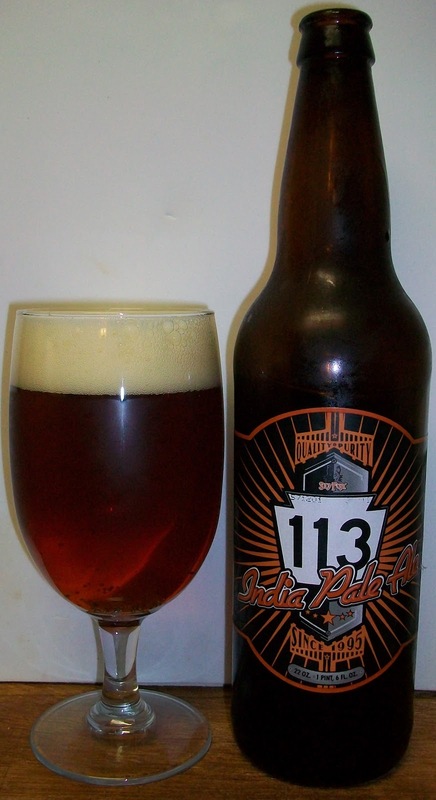 Amazing for a 113 IBU beer. There final aftertaste is of lingering hops but more floral and citrus not bitterness. There is also a nice sweetness on the aftertaste. This is a great IPA. I may have to do a head to head with Great Divide Titan and Evolution Lot #3 to see how has the best American IPA. The head on this beer has not quit. It has diminished to just a thin protective layer over the top of the beer with a nice ring around the class and it is leaving some very impressive lacing. This experience just keeps getting better as the beer warms and opens up a little. The hop complexity is also very impressive. The hop flavors range across the board, Citrus, Pine, Floral and Earthy; all without being overpowering or bitter. We are only at 60 degrees; I can’t wait to see what happens as this delicious beer really warms up. The second glass pours with a creamier head. Wow, that rich head added the creamiest mouthfeel to that sip. All and all this second glass seems richer and smoother than the first. This beer is going from great to exquisite as it warms. I’m now at the point that I’m savoring every bit of this delicious ale. What a great experience. The malt flavors are just outstanding at these temperatures and that great hop bite is still there on the finish. This is starting to feel full and satisfying like an imperial/double IPA but without the high alcohol. Well, that was another excellent offering from Sly Fox and this one was good to the last warm drop. This is a solid A+ for me. Rt. 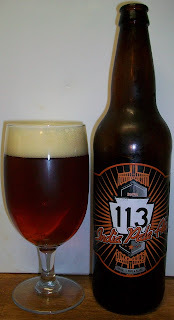 113 is full bodied excellently balance IPA with rich caramel malt flavors and the most exquisite hop complexity; all without being overpowering or bitter.